FCL splits wideband spectrum from your SDR into narrowband channels. This is useful for networks that have lots of transmitters side-by-side, like for example FM broadcast, TETRA, Tetrapol and GSM. On-the-fly frequency correction and signal power detection. Multiple input formats (float, unsigned and signed integer). We use a straightforward implementation that is cache- and vector-friendly and we have a sane pthreads scheduler. At least on our computers, FCL is 2 to 5 times faster than the GnuRadio implementation. Hence fcl stands for Fastest Channelizer in Litoměřice. You can find description of the mathematical principles of the channelizer in Chapter 2 of my thesis. The following chart compares FCL with GnuRadio 3.7.10. FCL was tuned using the hints below on this page, GnuRadio was profiled using volk_profile. Frequency correction in FCL was disabled. 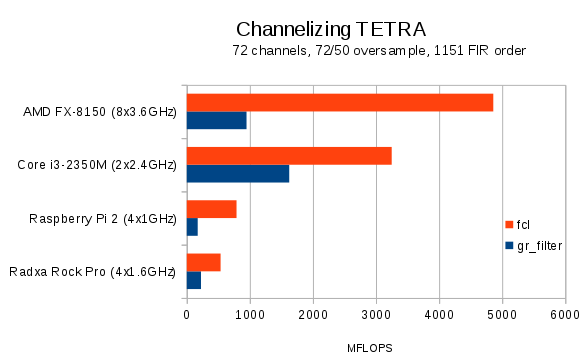 Practical results: Raspberry Pi 3 + rtl-sdr is able to receive 13 Tetra or Tetrapol channels in real time. As it maxes the usage of CPU and memory, proper cooling is necessary! On Raspberry Pi, adding “-march=native -mthumb-interwork -mfloat-abi=hard -mfpu=neon -mtune=native” to CFLAGS makes things even faster. Make sure you have correct GCC and core libraries! It builds .so modules for FIR of lengths 8-24 (where compiler can unroll loops) and one generic. These are loaded dynamically runtime. There is a convenient wrapper around gnuradio firdes called fir.py. rcos                ... use root raised cosine filter instead of Hamming window. There is and example of how to use FCL to receive TETRA in examples/tetra.py. Other examples may follow as we port other brmlab tools to FCL. The most expensive part is evaluating FIR filters. Computational demands scale almost linearly with filter length. So try to design your filters as short as possible. On fast computers with many cores, you can try increasing BUFSIZE and RETURNWORK in finetune.h. You can gain ~10 %.